Notes: I think I got all of the contents right. Any thoughts? That looks so delicious! And really filling. I think school lunches here in the states should start moving in that direction. The portions are just right, too, with lots of fresh food, which is mostly vegetables and grains, with just a small portion of meat. I wonder what kind of meat that is. An old friend said he was served horse there. Hello. I'm french so I apologize in advance for the mistakes. I can tell you that you will never find horse meat in a french canteen ! Not many people eat horse meat in France and a lot of people like myself never tasted it. Although I'm not shy with food : I eat our delicious (and so cliché) frogs and nails when I have the opportunity ;). The meat on this picture is minced beef. 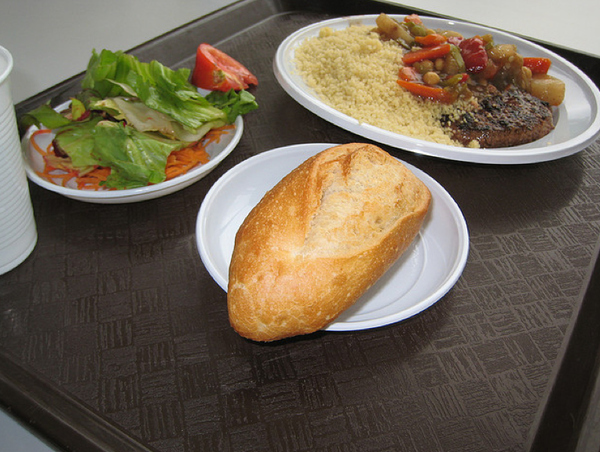 Couscous is one of French's favorite meal, probably a consequence of north african immigrants' influence. It's generally served with beef, lamb, chicken and/or merguez (a spicy maghrebi sausage). Yes, this is good. Tasty, light and quite healthy. Then again, it´s France. But of course, the menu should be changed for whole year by seasons. In my country, we had different meals nonstop, you would hardly find the same food twice in two-three months. When I see American USA, there is still only rubbish. I lived there for a while, years ago, I know. Europe HAD good food, but now lobby and "crisis" destroyed it here, too. I´ve read that South Korea and the Scandinavia are the best, Japanese got worse.